With organic seaweed & essential oils of sweet orange, lime & rosemary. 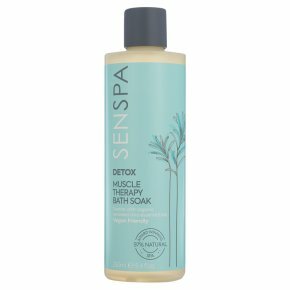 97% natural - natural body therapy.Sen Spa Detox muscle soak contains the exclusive Sen Spa signature scent, a blend of nine essential oils uniquely selected and blended to create a spa ambience reminiscent of the exotic East. These oils are combined with seaweed, dead sea salts and marine extracts to promote natural cleansing, aid detoxification and leave your body feeling rejuvenated and rehydrated. Warning: For external use only. Avoid contact with eyes. Should this occur rinse immediately with water. <br>Due to the high concentration of natural oils and botanicals, products may vary over time and from batch to batch, this does not affect the quality or safety of the product.